The track at Holmdel High School will probably have to be hosed down after all the fireworks light up the oval on the first Friday night in May. 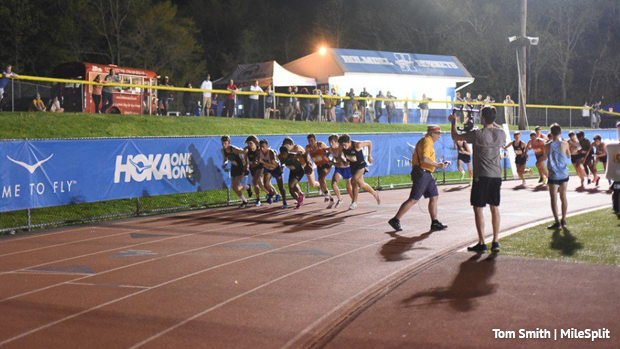 That's because Damon Godfrey, the meet director for Holmdel's Twilight meets, has put together a ridiculously loaded boys 3,200m race that could produce some of the fastest times ever run on NJ soil!! Godfrey wants this race to go sub-9 or possibly even sub 8:55, so he's been relentlessly working his phone non stop the last few weeks-texting, emailing, calling, and DM'ing coaches all over the state and beyond to put a red hot field on the line for the 12th annual Holmdel Twilight Series "Night of the 3200s'', which is scheduled to start at 6 p.m. on May 3. Godfrey, the head boys and girls XC coach at Holmdel, has assembled arguably the best non-Meet of Champions 3,200 field in the state with a star-studded lineup that features six state champions, three Foot Locker XC Nationals qualifiers, and several runners with sub 9:20's on their resumes. Holy Smokes is this race going to be lit!!! Ok, enough with all the suspense. It's time to give you the names! Here are the runners that Godfrey has received commitments from so far for the boys seeded heat! And he still could add a couple more hammers to the field! NJ MileSplit will be on-site to record the racing action. Liam Murphy of Allentown - the junior ran 8:54.22 to win the NJ indoor Meet of Champions title last month and was a finalist at Foot Locker XC Nationals. Jack Stanley of Mendham - the Princeton University bound Stanley won the Foot Locker Notheast Regional XC title last November and was the only runner in the country to earn All-American at both the Nike and Foot Locker XC Nationals in December. He owns PR's of 9:12.54/4:12.64 and is a mutiple state Group 3 champ. Connor Nisbet of Wilmington Friends - the Princeton University bound star has a 3,200 PR of 9:00.75 and has run 4:12.21 for 1,600. A FL XC finalist this past December, Nisbet is chasing the Delaware state record of 9:00.61, set in 2012 by Sam Parsons of Tatnall at the Arcadia Invit. Jack Jennings of Mendham - he ran a PR of 9:16.15 as a sophomore last spring to place fifth at the Meet of Champions and has a 1,600 PR of 4:18.79 and went 15:52 at Holmdel Park. The Christian Brothers quartet of Tim McInerney, Shaw Powell, Troy Hill and Luke Reid, Martin Riddell and Greg Eisenhower of Haddonfield, Ethan Wechsler of Cherokee, Vedang Lad and Luke Johnson of West Windsor-Plainsboro North, are all committed as well. Lad ran 9:11.68 when he was fourth in the 3,200 at the Meet of Champions last spring. Wechsler won the State Group 4 XC title last November and ran a 3,200 PR of 9:21.02 to place 6th at the Meet of Champions last month. McInerney, who is headed to Georgetown, has a 3,200 PR of 9:20.91, ran 4:10.37 when he was second at the Meet of Champions last June, and has won mutiple state Non-Public A titles. Powell won the state Non-Public A XC title this past November, and ran 8:39.06 for 3,000 and 9:20.95 for 3,200 as a sophomore last spring. How awesome is that field? Imagine if the great Devin Hart of Point Pleasant Boro, who won the New Balance National Indoor 2-mile title two weeks ago, was in this race!!! Godfrey reached out to Hart, but he already has a commitment that night. Godfrey is pumped up for this epic showdown, and rightfully so. Everyone should be jacked for this!!! Godfrey said he still has spots available for the seeded heat, so if you have a PR under 9:30 and you want to get into a race that gives you a great chance to shatter your PR, get in touch with Godfrey as soon as possible. There are also girls 3,200's races and slower heats of the boys 3,200 for runners to jump in. And if you really are a true fan of NJ track and field, then don't miss this one! Get to Holmdel on May 3rd!!! !